The Lewek Constellation has set an industry pipelay record in the GOM in 7,368 feet (2,246 metres) of water during her sea trials. In preparation for the execution of three subsea tie-back projects for Noble Energy, she performed her final pipelay trial in the US GOM and during the deployment of the 3.2 kilometre, 16-inch diameter, 28mm wall thickness pipeline, complete with the second end pipeline end termination (PLET), the tension recorded was 632mT, rendering this the highest tension ever experienced in the history of rigid reeled-lay operations. 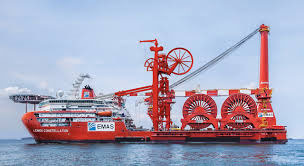 “Successfully laying the test pipe at this record-breaking top tension during pipelay trials is a significant achievement for EMAS and an industry first,” said Lionel Lee, Chairman, EMAS AMC. "It's a testament to the experience and expertise of our people combined with the quality of our new vessel built by EMAS Group’s subsidiary TRIYARDS in Vietnam. I want to acknowledge the hard work and dedication of our integrated project teams in preparation for this important milestone. “What this record means for clients going forward is that we can offer a more efficient pipelay solution in ultra-deep water for pipelines up to 16 inch in diameter when compared to traditional S-Lay or J-Lay methods, even with thick insulation coatings, thereby giving our clients more options to consider.” said John Meenaghan Vice President Global Operations.